Feel free to jump in and help eachother out! Don't forget to check out the mentorship directory! I can't for the life of me get GameMaker to run. I've tried uninstalling and reinstalling, restarting my computer, running as admin, basically everything I can think of. Anyone else experience this problem, or have any idea how to solve it? Oh no ): !! I'm not too familiar with GM but I'm gonna ask a few questions that might help point to the answer for others. What operating system are you running + version of gamemaker? Does the program launch anything or not at all? Oh right, that would have probably helped. Oops. Also I'm on a laptop with an integrated graphics chip, which shouldn't affect anything but who knows. The program just doesn't launch. I don't get a splash screen or anything. My computer does the whole 'thinking' cursor thing for maybe a second and then nothing happens. There isn't even a process or application to kill from the task manager. Right now I'm trying to uninstall anything that I newly installed (mainly other game making engines because I wanted to tool around for a bit with a few to find the right fit). Hmm I looked around GM forums a bit and maybe try this or look down this thread for some possible solutions. Decided to get it through Steam and it worked, instantly, with no fuss. So there's a work around if anyone else needs it. Tried with steam after the regular download wasn't working. Keep getting errors time and time again. Just thought I'd add my two cents. Happy developing! For some reason when i press x only the first frame of my attack animation plays, then the rest of the animation only plays if i move horizontally. I believe my move variable is putting out either -1, 0, or 1 depending on weather or not im hitting left or right or both. But if any of the code above my attacking code affecting the attacking code?? So in the frame after you first pressed X, sprite_index will begin as spr_player_swing, but there is no scenario where sprite_index emerges from your move code as spr_player_swing (i.e. it's always changed). I assume GM reacts to this by changing the sprite and reseting spr_player_swing's image_index (what frame of the animation its on). Then, in your attack code, you set sprite_index to spr_player_swing (if X is pressed), but the image_index has been reset! This causes only the first frame of its animation to ever be visible. To fix this, try restructuring this code into one if/elseif/else tree. This is just a rearrangement, so no other edits are needed (although, judging from other people's code I've been perusing, you don't need sprite_index != spr_player_swing. I suspect GM doesn't react if you set sprite_index to whatever sprite it's already set to). A lot of hunches at play here. Let me know if that helps! I tried restructuring the code like you said, and even trying to put the attack animation in a loop (i probably didnt do that correctly though), neither worked for some reason, I finally found a fix for it though. Ill put it here in case someone else has a similar issue. or i might have to again restructure this like you suggested, ill post my code again whenever i get everything hammered out in case anyone needs it for reference! Anyone got a good information base/ tutorial for the Game Maker scripting language? here's the gml reference and overview, and i'm not sure what your experience in coding is but there's a complete beginner's guide on the forums as well as a pdf. i found a website that has a few tutorials as well, and you could google youtube tutorials for the types of gameplay you're looking for. ohhhh heck really ): i should probably remove the mac gm download link because that's a huge restriction i wasn't aware of. stencyl is the only 2D mac program on my radar but i don't own a mac so i'm not really familiar with other stuff. i think it's a pretty solid alternative but i'll let someone else have a more final word on this. OHHH YIKES yeah that's understandable. sorry to hear that ): !!! Hey all, was wondering if anybody could lend me a hand in Construct 2. I' trying to figure out a way to get the player sprite to teleport, but I can't figure out which events/behaviors I need to set up to make it happen, and Google isn't helping. I want the player character to touch a transparent sprite, which will be the 'stairs', and have it jump them to the location at the top of the stairs instead of having an actual climbing animation. hi! you'll likely test for a collision (or overlap, but a collision is a one-time fire). the event that would fire off would be a "set player position to object--i'd recommend creating some empty object(s) so you can move the the target points (and to see them visually in the editor! )around if you wish w/o having to change some hard number x,y values. I imagine it will be something similar to this tutorial, but without switching layers. i made a very messy example here. perhaps you can streamline it for your own use. explanation: when the player collides with the object, 'stairs' they are teleported to image point 1 of the stiars, which i set to the top right. taking them to the higher level. I now have teleporting stairs! Yay! And best of all it only took three events to make it all work! Thank you for all the help! This is for RPG Maker VX Ace. I'm trying to make a common event that shows some clue dialogue after you collect certain items, but when I test it, it won't do a thing when I have the items. I feel like I'm missing something but I haven't found any common event guides that have this. I'm going to continue looking but I might as well also put this here just in case someone has done this before. Thanks! Yeah I was guessing it was switches! Thanks, it worked. Ok. New problem I mentioned. I edited my parallax map titles and added a page with items, and now I can't walk at all over my parallax backgrounds. I made a normal tileset area and I can walk on that. I can't find anyone else with this problem? I am just going to try to make a new tileset for my parallax stuff. I'm still messing with it. I have been using the tilesets from that tutorial and they have been working fine until now. My scripts are all put in right, which is why I'm genuinely confused by why I just can't walk on these tiles. I made a new map with the parallax tileset and it still didn't work so I just gotta keep troubleshooting. It doesn't seem like many people have had this problem/it just doesn't come up in searches. I asked in the rpg maker forums (at least, I sent a post to be approved for help) so I'm going to see where that goes. sprite has a text instance variable named 'dialog' that's just set to some chatter. if you want to copy it for testing just put in filler text. sprite font and dialog box are set on layer dialog, everything else is on the main layer. so the idea here is that when the player is no longer overlapping the sprite, the dialog goes invisible, right?? but it doesn't. it just hangs there. i want it to go away. it wont let me make an 'else' variable that turns the layer invisible. i cant figure that one out either. 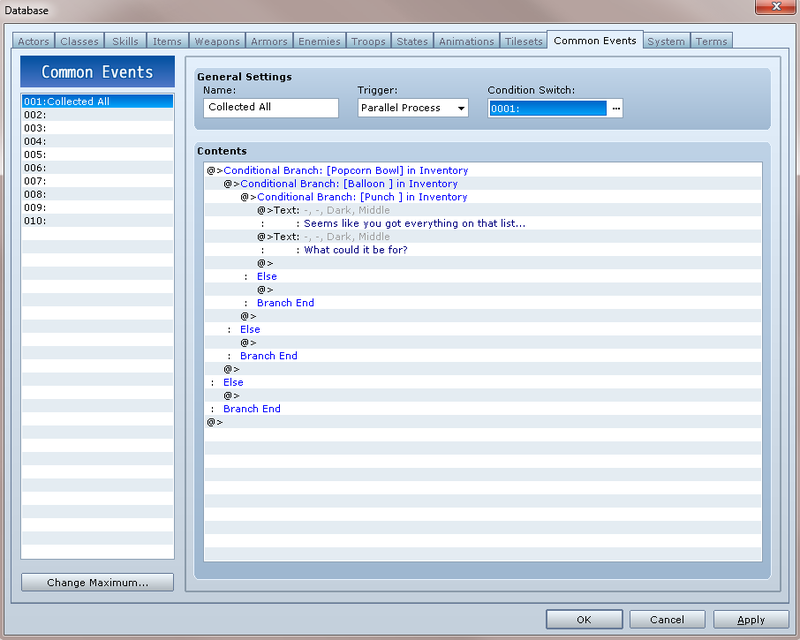 I haven't used construct 2, but it seems there isn't an event that tells the dialog box to go away after it comes up. As it is, the condition "playerBox is not overlapping Sprite" is under the Keyboard "E" pressed event. Does your dialog box go away if you press E and your player isn't overlapping the sprite? the dialogue box is on layer 'dialogue', so the idea is that it's supposed to go away by making the entire layer it's on invisible when you're no longer overlapping the npc sprite. to answer your second question, not it does not. it doesnt go away even if you disable pressed E either. if you disable pressed E, the dialogue appears when you overlap the sprite and stays when you are no longer overlapping the sprite, even though that's the condition for the layer to turn invisibile again. hi!! whats happening here is that "not overlapping" is a condition underneath a key press + overlapping. the whole group of events only fires on a key press with the overlapping condition, but not overlapping will never fire bc it would only be checked if the above conditions were true!! im not too sure what you need exactly eith the two diff npcs but is it possible to solve with booleans--either one or the other or both can be used to toggle the layer's visibility? hey!!! i'm using stencyl and I'm trying to put a text box into my game. i followed the image here (under the example: text input section), but it doesn't mention anything about actually drawing the text on the screen. i've tried a few things, but anything remotely similar to code completely evades me,,,, also i added the userInput attribute but idk if i have to do anything with it other than put it in the code? i also want the text to fade out when pressing the enter key but i've been searching through the events and can't find something that does that. maybe after i figure out how to draw the text it'll be easier to find? Maybe make it part of the background or foreground? I don't really know sorry. I'm messing with GameMaker myself trying to learn how it works and that was the first thing that came to mind. I'm trying to figure out how to make the menu options (for player choices) appear inside of the textbox instead of in the middle of the screen. I've figured out how to give the buttons a transparent background so that they look how I want but I can't figure out how to move them. If I could just get them to display at the bottom left part of the screen that would be good enough. hmmm i'm still not very familiar with renpy but i believe this can be done by declaring some style properties, and here seems to be some documentation on position specifically.